Description: These versatile sprayers are ideal for a variety of professional applications…performance and price make them an outstanding value. 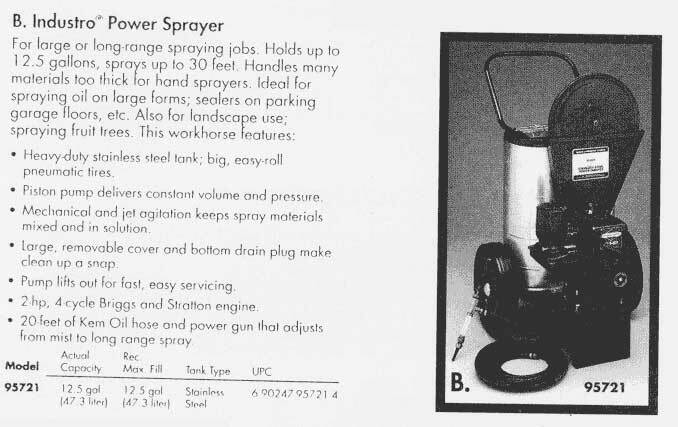 ·Famous Roto-Valve spray control-rotates 360 degrees for easy spray placement. ·Long, curved, heavy-duty, brass spray extension and brass fan nozzle …easily accepts optional Spraying Systems Co. nozzles. ·Large poly funnel for easy filling. ·Quality brass pump….especially suited for hot water applications. ·Thick Endurall epoxy-coating is applied inside and out over strong galvanized steel for maximum possible corrosion resistance. ·Corrosion and chemical-resistant polyamide pump. ·Removable supply tube for easier cleaning. Description: BAK-PAK sprayers are the choice for bigger jobs Choose the X-Pert heavy duty poly unit or Suprema stainless steel model The X-Pert Bak-Pak sprayer features heavy-duty, one-piece poly tank; strainer; poly piston pump; right or left hand pumping and spraying; long extension with Teejet fan nozzle; and a unique harness system for carrying comfort. The Suprema Bak-Pak features Kem Oil hose; brass pump and long brass extension. A Suprema poly Bak-Pak featuring our massive poly valve and a cone nozzle is also available. Description: Plastic information pouch attached to sprayer, holds MSDS sheets, chemical labels, sprayer instructions, parts kits, etc. Has check-off boxes for items it contains. Very convenient! ·Heavy-duty stainless steel tank; big, easy-roll pneumatic tires. 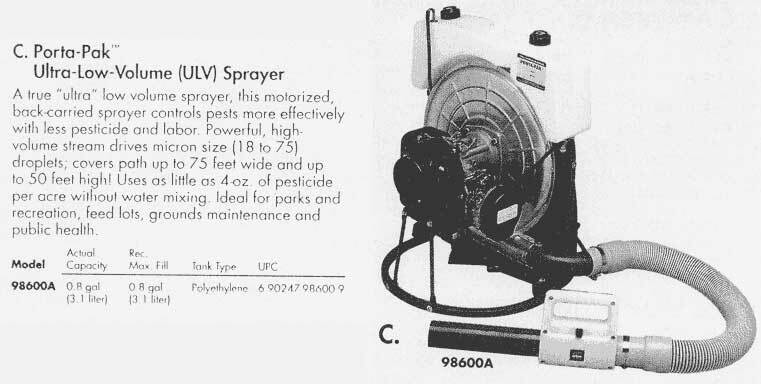 Description: A true ultra low volume sprayer, this motorized, back-carried sprayer controls pest more effectively with less pesticide and labor. Powerful, high, volume stream drives micron size (18 to 75) droplets; covers path up to 75 feet wide and up to 50 feet high! Uses as little as 4-oz of pesticide per acre without water mixing. Ideal for parks and recreation, feed lots, grounds maintenance and public health. Description: Features oversize wheels and special sprayer attachment…makes it easy to transport filled compression sprayer around the job site to reduce work during day-long spraying jobs.